Successfully Added USB Christmas Tree with Keyboard Response LED Lights to your Shopping Cart. Desktop sized Christmas tree with colored LED lights. This unique Christmas Gadget has a special feature that will really amaze you and your coworkers - as you type on your computer the LED lights change colors! How is that for modern holiday magic? Simply connect the Christmas Tree to your computer USB and the tree's first six red lights illuminate. Then as you start typing on your computer the other colored lights interactively light up along with your typing. The faster you type, the more colorful the LED's light up and the brighter they glow. The Festivus LED Color Changing Flexible Rope Light is highly energy efficient so you get the benefit of high intensity, evenly distributed illumination, without the costs and heat associated with traditional lighting. Built with only quality parts, this LED rope light will last you 50,000+ hours, so you never have to worry about replacing broken holiday lights again! Turn that boring desktop into something a little more festive for the holiday season. 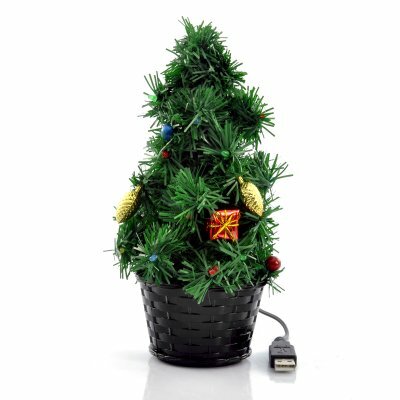 With the USB Christmas Tree with Keyboard Response LED Lights you can make your work desk time a little more joyful. In stock now, we guarantee to ship this product out the next day. Brought to you by the leader in USB and PC gadgets, Chinavasion. The faster you type the more LED's light up until all 25 are illuminated. Stop typing will fade out all the lights except for the red ones.